Willie Paterson (Centre Forward, 1914-25) - Willie Paterson from Hill of Beath was the son of Cowden boss Sandy Paterson. He played for Foulford White Rose and Cowdenbeath Wednesday before joining Cowden in 1914. Rangers signed him in 1916 before he enlisted in the Royal Field Artillery. Post-war, he returned to Cowden and scored 30 goals in 22 League matches before Derby's bid of £3,500 was accepted. Paterson spent 3 years at the Baseball Ground. 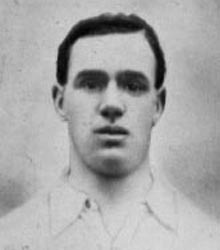 In 1924, he rejoined Cowdenbeath but couldn’t displace the scoring sensation, Willie Devlin. He then went to Coventry City. Later, he had a successful career in the USA as a player and manager at Springfield, Fall River, and Providence. In 1930, as player/manager of the Gold-Bugs he scored 44 goals in 36 games. Then he took charge at New York Nationals. In 1933 he came home and when his father died that December, Willie was caretaker boss at Central Park. For the rest of his days, Willie lived in Saline and was an avid Cowdenbeath supporter until his death in 1970.